The Monitor My Use portal will be unavailable on Monday, April 22, for system upgrades. By setting up an online profile with Fort Collins Utilities you have access to Monitor My Use: a free tool that allows you to see your electricity and water usage on a daily basis. 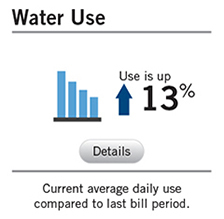 By monitoring your use, you can control your costs and conserve resources. Log in or create an account today. Once you are signed in, click the "Monitor My Use" icon to get started (ensure pop-up blockers are disabled). Once you have clicked on the Monitor My Use icon, you will be directed to your dashboard. 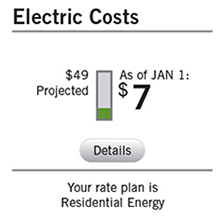 Here you will see a snapshot of your electric and/or water costs and usage for the current bill period. Clicking "Details" on either of the tools will allow you to see more information, including usage/cost details for different intervals. Also on the dashboard, you will see information about rebates and tips to help you cut costs, be more efficient and reduce your impact. Note: All images shown are screenshots. Log in to use the tool with your own data. 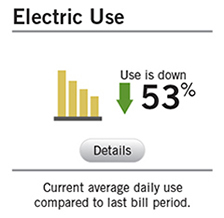 Clicking "Details" on either of the dashboard tools allows you to see your electric and/or water usage in a bar graph format. If there is a specific day that you are concerned about, click on that particular day and view the hourly data. 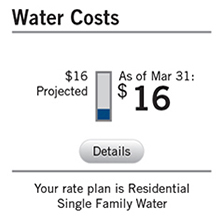 The detailed view also allows you to turn on the "Temp" or "Rain" (water customers only) overlays to see how your use and cost details compare to the weather. The "Alerts" tab allows you to set up email or text messages alerts when your bill has reached a certain amount each month. This can help you to budget as well as conserve. See the online tool FAQs for more information on how to best use this tool.